Cake illustration by Anthony Picco see http://www.aspiccodesign.wix.com/illustration for more of his work. 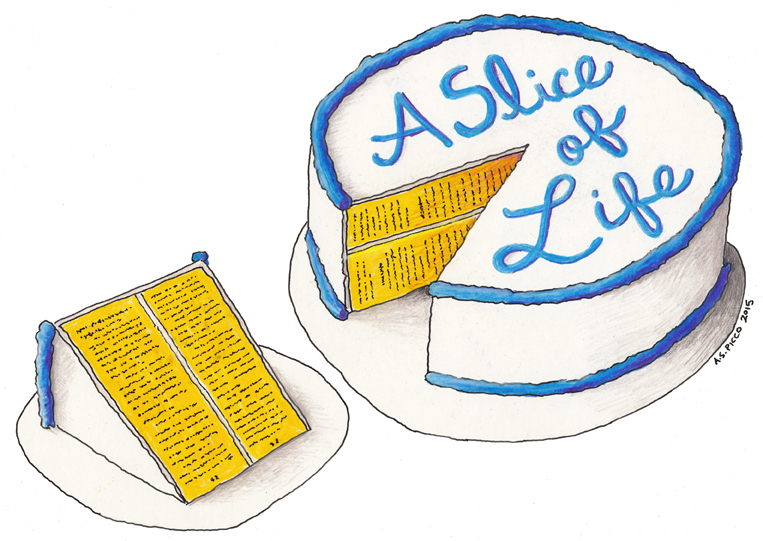 Lit Youngstown and the YWCA of Youngstown will co-host Slice of Life: Stories and Dessert, an evening of storytelling featuring true tales from five local writers and storytellers, and delicious desserts from fine bakers, on Tuesday September 29 at 7 p.m., at YWCA of Youngstown, 25 W. Rayen Avenue, Youngstown. The event is a benefit for Lit Youngstown and the YWCA of Youngstown, and includes an opportunity to purchase books for the children’s library at the YWCA. Tickets for the event at $5 in advance, $8 at the door. For tickets, contact Melissa Papini at the YWCA – 330-746-6361, x118 or Lit Youngstown – 330-333-1619 or lityoungstown@gmail.com. At the Slice of Life event, instead of a reading similar to what we host on First Wednesday, five local writers and storytellers –Davita Fitzgerald, Kris Harrington, Becky Ann Harker, Liz Hill, and Terry L. Shears — will each tell a true story from their own life. The program, modeled on The Moth Radio Hour’s Story Slams and the Told Cleveland project, is the first storytelling event of its kind here in Youngstown. Building on the slice of life theme, the event will offer home-baked goodies created by book-loving bakers in the area. At the event, sample books will be available to give attendees a sense of what their donations will buy. The facility needs multi-cultural books that reflect “real people doing real things,” especially reflecting people in non-traditional gender careers, people with different abilities, and books showing a diversity of family styles. This entry was posted in Uncategorized on September 3, 2015 by lityoungstown.